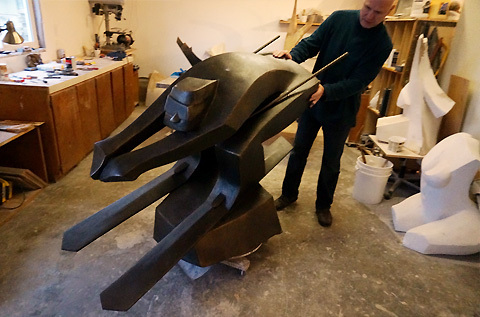 Pavel’s sculptures are displayed in several galleries in British Columbia. His artwork found place in private collections across Canada, in Europe, USA, New Zealand, and Australia. He had one-man shows in Williams Lake, 100 Mile House, Hope, Coquitlam, and Kelowna. He was guest artist at Ars Longa art shows in Kelowna in 2007, 2008, and 2012. His sculpture design was chosen as The Okanagan Art Council Award for 2008. In 2010 and 2011 he participated in group shows in CityScape Community Art Space in North Vancouver. In 2012 Pavel finished two public art projects: Installation of 16 sculptures in the new foyer of Kelowna General Hospital, and also entrance signs for Village of Clinton. In June 2013 his art was displayed in the Seymour Art Gallery in North Vancouver. In April 2014 he received an Award of Excellence during the exhibition in Campbell River Art Gallery. Since May 2014 he lives and works in his studio in Campbell River at 262 Island Hwy.